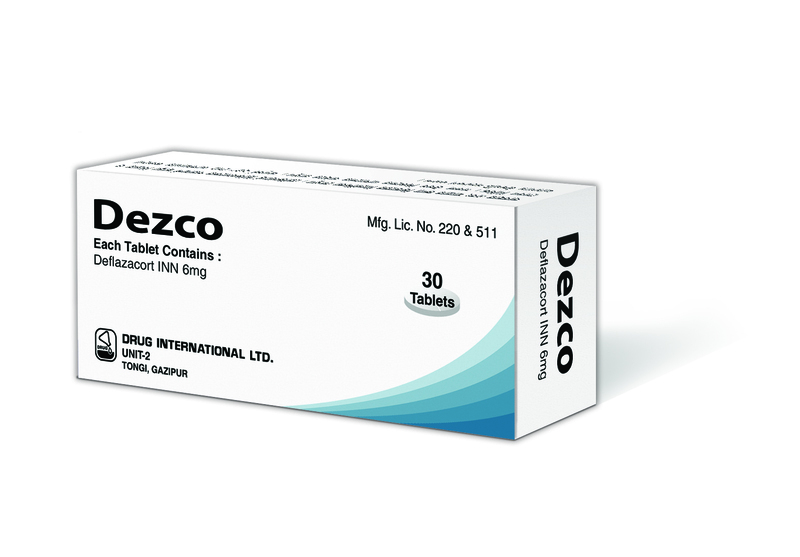 Composition : Dezco Tablet : Each Tablet Contains Deflazacort INN 6mg. Description : Deflazacort is an oxazoline derivative of prednisolone with anti-inflammatory and immunosuppressive activity. Deflazacort is a glucocorticoid and 6mg of Deflazacort has approximately the same anti-inflammatory potency as 5mg Prednisolone or prednisone. Indications : It is indicated for the treatment of a variety of inflammatory conditions including: Duchenne muscular dystrophy (DMD) in patients 5 years of age and older, Severe allergic reactions, e.g. anaphylaxis, Asthma, Rheumatoid arthritis, juvenile chronic arthritis, polymyalgia rheumatica, Inflammatory bowel disease such as Crohn's disease and ulcerative colitis, Inflammatory disorders of the kidney, such as nephritic syndrome and interstitial nephritis,Inflammatory eye disorders, e.g. uveitis, optic neuritis, Inflammatory skin disorders, including pemphigus vularis, bullous pemphigoid and pyoderma gangrenosum, Inflammatory disease of the skin and muscles (dermatomyositis), Systemic lupus erythematosus, Mixed connective tissue disease, Rare condition involving inflammation in the walls of arteries (polyarteritis nodosa), Sarcoidosis, Rheumatic carditis, Cancer of the bone marrow (multiple myeloma), Acute and lymphatic leukaemia, Cancer of the lymph nodes (lymphoma), Idiopathic thrombocytopenic purpura, Anaemia caused by the immune system attacking red blood cells (autoimmune haemolytic anaemia) Helping to prevent the immune system attacking a transplanted organ, e.g. heart, liver, kidney etc. Dosage and administration : When Deflazacort is used for long term, the maintenance dose should be kept as low as possible. Dosage may need to be increased during exacerbation of illness. It should not stop taking medicine suddenly if it has been taking for more than three weeks. This is because long-term use of corticosteroids can suppress the natural production of corticosteroids by the adrenal glands, which means that the body becomes temporarily reliant on the medicine. When it is time to stop treatment the dose should be tapered down gradually, to allow the adrenal glands to start producing adequate amounts of natural steroids again. Adults : The usual dose in adults for most conditions, including rheumatoid arthritis, is in the range of 3-18mg taken orally per day. In some instances, an initial dose of up to 120mg per day may be needed. The dose in adults with severe asthma may be up to 48 to 72mg per day to begin with. This dose may be gradually reduced once the asthma attack has been controlled. Other conditions : The dose of Deflazacort depends on clinical need titrated to the lowest effective dose for maintenance. Starting doses may be estimated on the basis of ratio of 5mg prednisone or prednisolone to 6mg. Hepatic Impairment : In patients with hepatic impairment, blood levels of Deflazacort may be increased. Therefore the dose of Deflazacort should be carefully monitored and adjusted to the minimum effective dose. Renal Impairment : In renally impaired patients, no special precautions other than those usually adopted in patients receiving glucocorticoid therapy are necessary. Elderly : In elderly patients, no special precautions other than those usually adopted in patients receiving glucocorticoid therapy are necessary. The common adverse effects of systemic corticosteroids may be associated with more serious consequences in old age. Children : The usual dose in children with chronic arthritis is between 0.25-1.0mg/kg bodyweight per day. The usual dose in children with nephrotic syndrome is 1.5mg/kg bodyweight per day, to begin with. This dose may be gradually reduced according to the child's response. The usual dose for children with asthma is between 0.25-1.0mg/kg bodyweight every other day. Or, as directed by the registered physician. Use in pregnancy and lactation : Pregnancy : Deflazacort does cross the placenta. However, when administered for prolonged periods or repeatedly during pregnancy, corticosteroids may increase the risk of intra-uterine growth retardation. As with all drugs, corticosteroids should only be prescribed when the benefits to the mother and child outweigh the risks. Nursing mother : Corticosteroids are excreted in breast milk, although no data are available for Deflazacort. Doses of up to 50mg daily of Deflazacort are unlikely to cause systemic effects in the infant. Infants of mothers taking higher doses than this may have a degree of adrenal suppression but the benefits of breast feeding are likely to outweigh any theoretical risk. Packing : Dezco Tablet : Each box contains 3 x 10's tablets in blister pack.